I use a fan heater to warm my room. 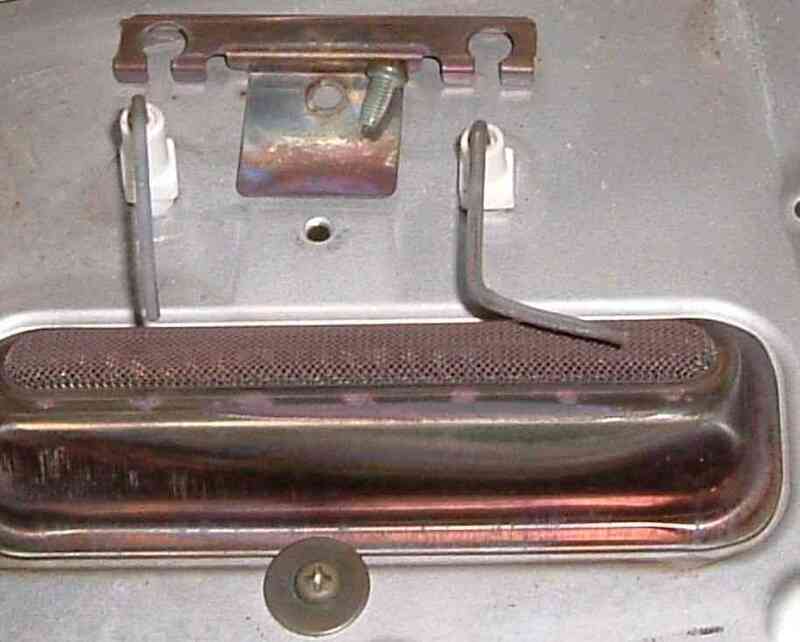 This heater was made by Dainichi in 2005 and is called Blue Heater. The type is FW-321S. I have been used for 6 or 7 seasons. I have to repeat start all most 10 times to burn. I had repaired another kerosene fan heater by Sharp. Then I cleaned flame rod sand ignition rod. I disassembled this one and cleaned them as before. It does not improve. Googling, a few sites shows how to repair it. It seems that carburetor is bad. A site describes why it misses firing. He cleans needle by mechanical polishing. Another sites describes how to take the carburetor to pieces and cleaned by burning. One more site cleaned needle by carburetor cleaner. A site describes how to disassemble in detail. I removed two bind M4 screws and loosened two union nuts to take out the carburetor. I also unconnected four wiring connectors. I removed a plug with O-ring. A tappet with two springs came out. I found out a tiny retainer ring. But the needle did not come out. An hour or two hours later I found a lot of white sand on the newspaper. The sand appeared because kerosene evaporated. I shocked the cylindrical case on the kitchen table again and again... Sand came out again. The inner came near. I pulled out by nipper. 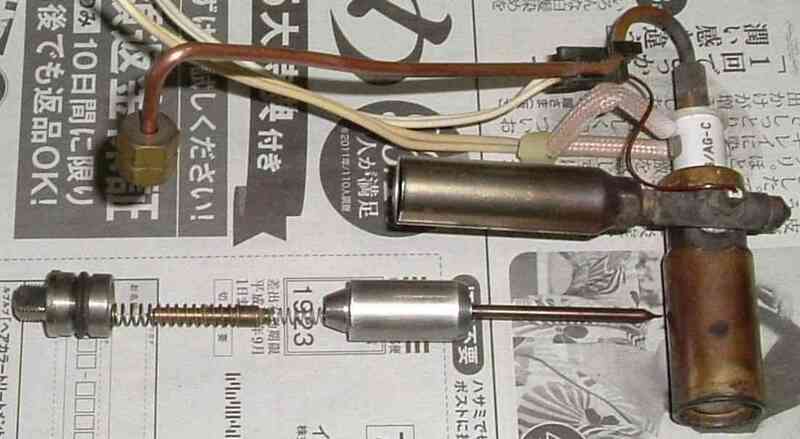 I show the disassembled armature with a needle. I removed a E-ring. I hesitated to polish the armature by sand paper. I feared to decrease gap. I soaked it in kerosene and polished in cloth. The dark dirt is not erosion but something. The needle was sticked with black pitch. The tip is too thin to polish. I burned it by stove burner. It burned easily because it was carbon. The outer of the carburetor cannot burn by stove. I pinched the needle by disposal chop stick. The type of chop stick is called waribashi. Waribashi is made of woods. Therefore it insulates heat. The tip was burned black. 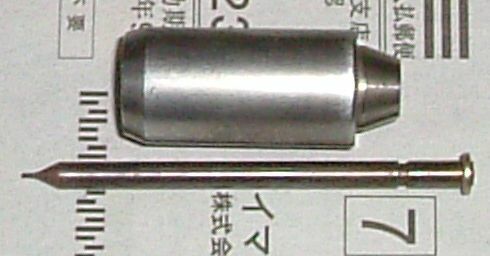 I inserted the assembled needle with two springs and removed. I removed the needle and found needle covered with thin tar. I repeated a few times. I pushed springs many times. The needle began to move in smooth. I assembled the plug. I pushed the tip of needle by nail. The needle was pushed and came out off nail. It took a time to assemble the carburetor on the frame. The bracket to position the caburetor of SUS was difficult for me. I tell how the caburetor works in the disassembled photo. Kerosene is transfered to the top of the caburetor by copper pipe witn union nut. The kerosene is heated by electricity. You see the two knit sleeved wirings. The other thin wirings is to measure temperature, I think. The kerosen is mixed with air in the cyrindrical brass chamber. 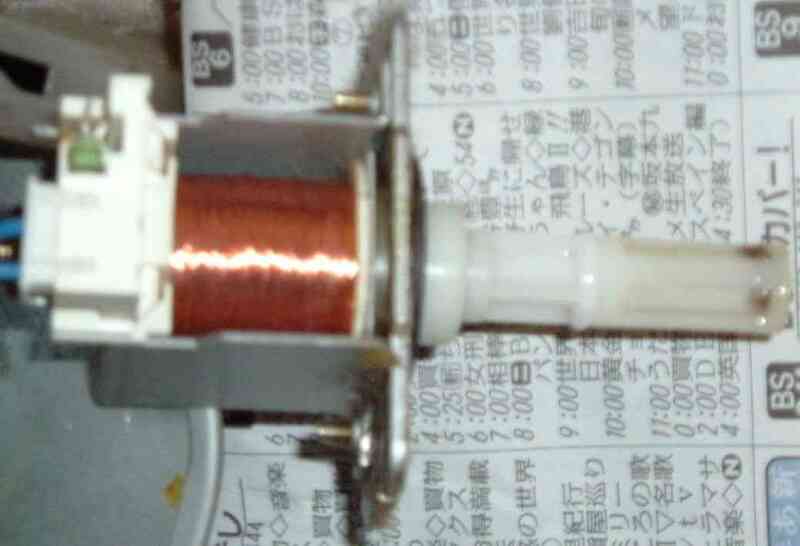 If coil current is on, the steel armature is pulled with the needle and orifice is open. The mist flows from the orifice to the bottom of burner. The extra kerosene not to be mist returns through plug and drain pipe. 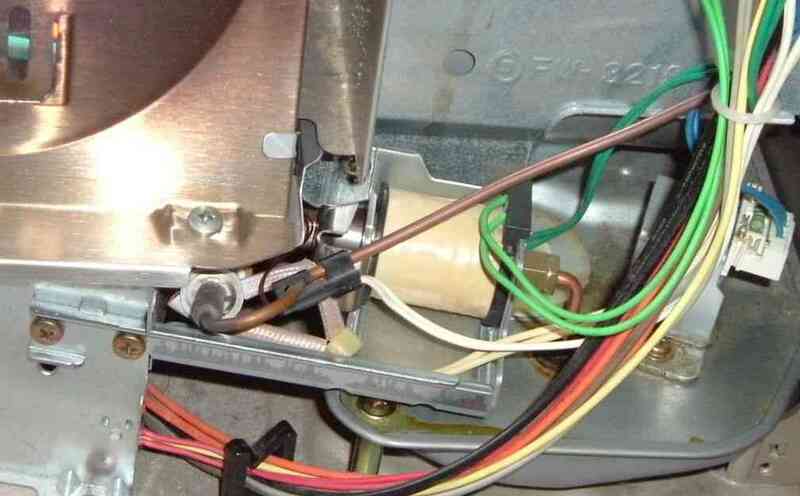 I inserted the tip of caburetor in the burner and attached another bracket to fix the caburetor. I also connected four connectors. I pluged AC line and turned on. The heater ignitioned well. I turned off and turned on. The heater failed to ignite. I pressed run twice. Although I have to press run five times now, it improved 10 times before. And the heater burns stable with minimum heating. It could not control to burn constantly. It made noise with pulse before. I cleaned the burner net by wire brush and filed tip surface of flame rod again. The result is the same as before. I collected silica, silica came out when I disassembled the caburetor. If the silica came from air, it would be found in the exit of warm air. I have seen them in the heaters by Sanyo and Sharp. Fig.8 shows ignite rod and flame rod. The right one is the flame rod. I filed it. I removed the burner and cleaned by steel wire brush. The metal net might be rusted. I remembered Sharp adopted ceramic burner. 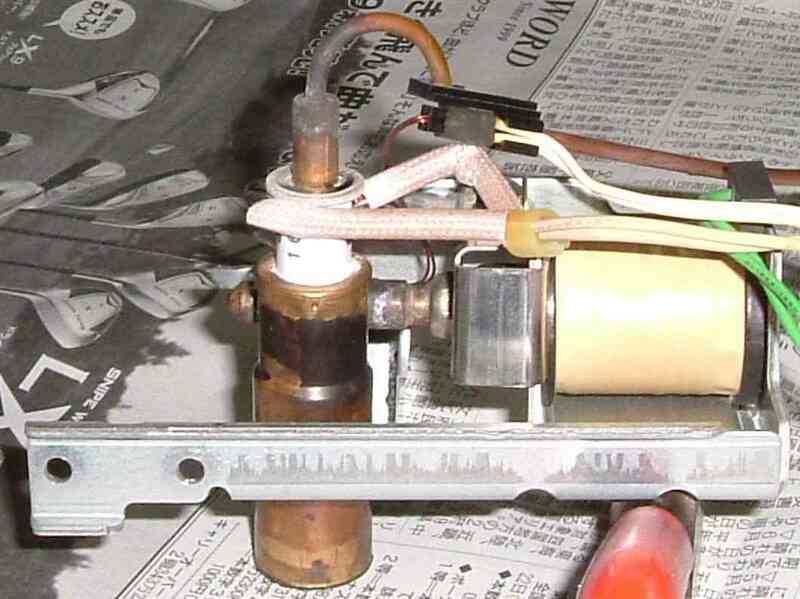 The bottom of Dainichi's burner is made of heat conductive alminum. Mist of kerosene with air enters from the right bottom and flows through U shape passage. It is reasonable and would be cheap except for life. The kerosene fan heater fails to ignite five times. I habe been doubtful for detecting flame, otherwise I suppose that fuel may not be enough to ignite. I loosened a union nut and two bind screws. I removed the fuel pump. I saw dust in the tip of it. I removed it. I ran and the heater fired at once. A few days later, the heater needs five times to ignite. A site shows the principle of magnetic pump in animation. I disassembled the fuel pump. 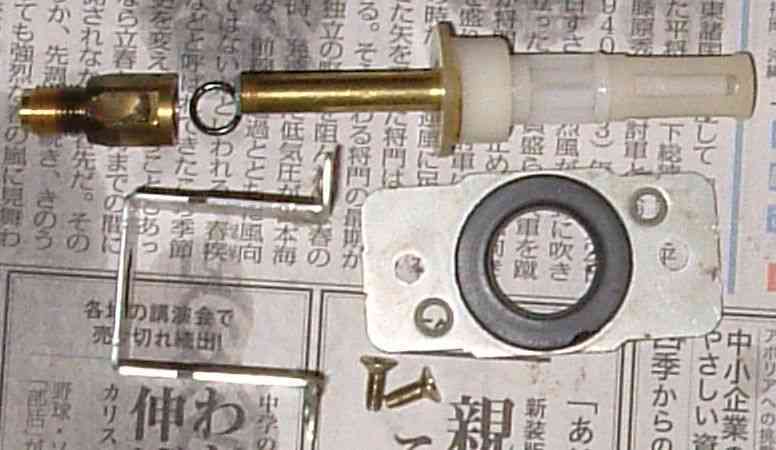 The valve is in the brass cylinder. The outlet hole is smaller than inlet. If I could disassemble and clean the cylinder, The fuel pump would repair.